The Cupertino giant files a design for a cosmetically attractive composite material. It may point the way to indestructible iDevices. Apple patents come, and Apple patents go (and some get shelved for future legal battles). Yet occasionally one stands out: Like this one, for a cosmetically attractive composite material. It may point the way to future indestructible iDevices. If trawling through Apple’s extensive and expanding patent library teaches you anything, it’s patience. You never know if a particular idea–no matter how neat–will ever see the light of day. But we really hope the “composite laminate having an improved cosmetic surface and method of making same” is a sign of things to come. When the iPhone 4 was revealed by Steve Jobs earlier this year, complete with toughened glass on both front and rear faces, our FastCompany.com editor’s chatroom was full of comments that varied from complimenting its beauty, to worrying about how easily the shiny high-tech bugger would shatter if you dropped it. Let’s boil that down. First, a composite material is one made by combining a number of different components in a way that typically maximizes the benefits of all of them: Fiber glass is a simple composite for example, benefiting from the flexibility and durability of the glass fibers, and the sealing properties of the resin matrix the fibers sit in. Because of their benefits over traditional materials like metal or wood, composites are finding homes in all sorts of places from airliners like the Boeing 777 to the newest armor on tanks. And Apple’s composite is a layered structure, made of sheets of some stuff that’re glued together using a resin, in a way that the final finished surface is immediately pleasing to the eye. The “stuff” could be carbon fibers or glass fibers, either woven or nonwoven, and they could be either pigmented, opaque or (presumably) translucent. 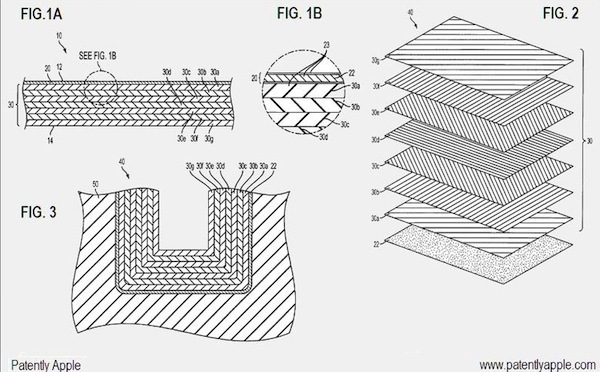 Apple’s trick seems to be in a clever multiple-layering of the “prepreg” sheets so that even if they include carbon fiber (for strength, and electrical-shielding powers) they won’t be unattractive to the eye. The patent notes that existing carbon materials are almost always black, and that while plastics are frequently used in portable devices, composites have many benefits. They’ve even come up with a clever–i.e. patentable–way to simply manufacture this stuff, even when formed around corners in the gadget’s form. We know Apple is interested in innovative materials, thanks to its glass-backed iPhone 4 and use of liquid metal, so here’s what we hope this patent means: A drop-proof, shatter-proof and damn-near bulletproof chassis for the iPhone 5, iPod Touch 2011, MacBook … whatever. Apple, thanks to its reputation for high-quality design, high-prices and high product quality now has a vested interest in making your iDevices survivable–unlike many vendors which almost have a vested interest in having you break ’em frequently, so a composite iPhone would seem a perfect solution.